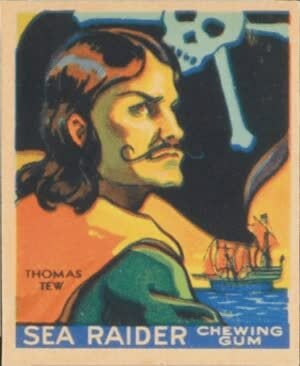 Thomas Tew was a 17th century English pirate that was known to have invented the Pirate Round. Although he had only a very short lived career, Tew will always be remembered for his contributions to piracy in the Indian Ocean, the development of Madagascar and helping Henry Every capture the Grand Mughal fleet during the event known as the Capture of the Gang-i-Sawai, a feat with which he paid for with his life. Nobody knows exactly where Thomas Tew was born, however it is known that there were a family of Tew's that lived in the southern coastal areas of England. This is most likely where Tew began his sailing career. Tew was known for his hard drinking and swearing. He also smoked a pipe generally as he got older, something he may have picked up in the Indian Ocean. However, early in his life, Tew was convicted of an unspecified crime and sent to serve a sentence of working hard labor in the West Indies in 1665. However this date is disputed and can also be as high as 1675 to 1680. Regardless of when he arrived in the Caribbean, Tew eventually finished his sentence and decided to stay in the region instead of returning home. He started out working in the maritime industry once again and worked his way up to becoming a captain and getting a commission for his own ship. He then began operating as a privateer in the waters around British Jamaica and Port Royal. Sworn testimony places Tew near Jamaica and Bermuda by 1682 so either his crime was not too harsh or the earlier dates of when he came to the Caribbean are true. Its was during this time he was known as a dishonest privateer rather than a full fledged pirate. Tew was next known to be pirating Spanish and French ships around Bermuda in 1690. He was still a privateer at this time. 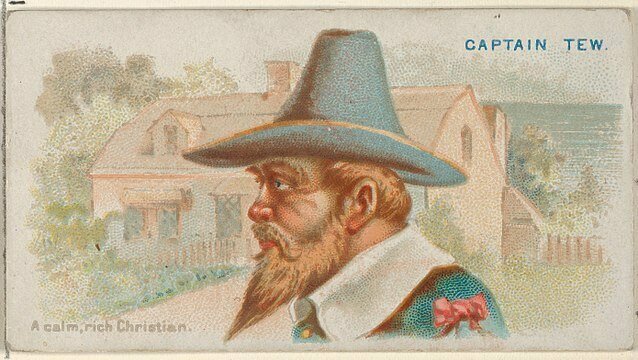 In fact while his nickname is the 'Rhode Island Pirate', he never actually went to New England until 1694 after his first Pirate Round in the Indian Ocean. By 1692 he received a Letter of Marque from the governor of Bermuda named Isaac Richier along with a new ship and was sent to destroy the French fortress at Goree. A few wealthy Bermudian landowners decided to invest in the venture and they provided him with a 70-ton sloop named Amity that was armed with eight cannons along with 46 crew. This bolstered Tew's forces and Tew along with another captain set out in order to privateer against the French near James Island and the River Gambia in Africa. When the fleet commander Tew was sailing with was lost in a storm, Tew and the crew took a vote and decided to become pirates. When Tew approached the crew with his ideas and schemes to become a pirate, according to some the crew responded "A gold chain or a wooden leg, we'll follow you". Next the pirates elected the appropriate roles and created a set of rules in following with the pirate code. Tew and his crew set up their base on the pirate haven of Madagascar along with other pirates that were operating in the Indian Ocean. While not many, there were a few buccaneers who fled the increased imperial powers in the West Indies to try their hand at other targets in other oceans of the world. Thus by sailing from the Caribbean to the Indian Ocean, Tew was one of the first pirates to innovate what would commonly be called the Pirate Round. Thomas Tew began the fFirst Pirate Round by sailing from the Atlantic coast to the African island of Madagascar in 1693. He reached the Red Sea and despite only having a small sloop with a few cannons and a handful of crew, managed to capture several treasure laden ships as they passed from the Ottoman Empire. The Indian ship held nearly 300 soldiers but the entire ship surrendered without a fight for whatever reason. Tew and the crew were ecstatic to find about £100,000 in gold and silver along with ivory, spices, gemstones and silk. Each crew member received a share of about £1,200 to £3,000. Tew got about £8,000. After the successful capture Tew wanted to stay in the Indian Ocean and continue robbing other ships trading throughout the Mughal and Ottoman Empires. 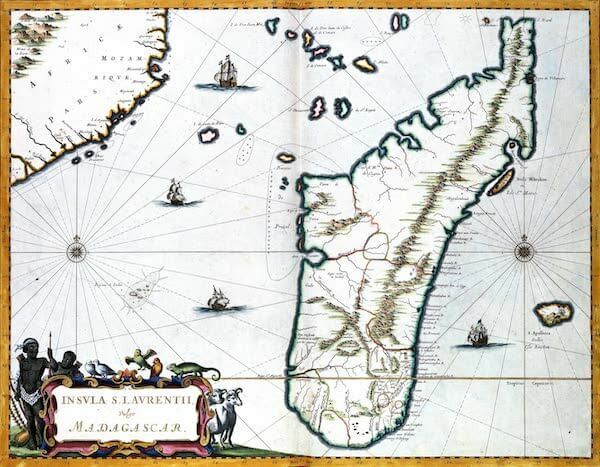 However, his crew was not having it and the pirates set back for Madagascar in order to round the Cape of Good Hope and head back to the Atlantic to spend their treasure. Some of the crew reduced to stay in Madagascar however, Tew and the Amity set a course for the Americas. Instead of heading towards the Caribbean the crew was to head towards the North American colonies due to a storm. Eventually they landed at Newport in the Colony of Rhode Island & Providence Plantations in April of 1694, a known pirate port and place to sell their goods on the black market. In addition to selling all of their goods quickly due to the draconian British mercantilist policies. In Rhode Island Tew was also able to secure a commission from the local governor John Cranston in order to raid the shipping lanes of the French trying to send their goods to the New World. Tew accepted the commission in exchange for £500 and began privateering off the coast of British North America. Eventually the crew ended up docking in New York City harbor and becoming friends with the local governor, Benjamin Fletcher. Through Fletcher Tew was able to pay off the original investors on the Amity who made 14x their first investment. It appears everything was ok with the Royal government because there seemed to be no reprisals for Tew. This prompted him to have a second go considering the first one was so successful. Tew's second attempt at the Pirate Round occurred in November of 1694 when he received a Letter of Marque from Governor Fletcher in order to set out on another pirating cruise in the Indian Ocean. He departed with a crew of 30-40 men however, by the time he arrived in Madagascar he had increased that to 50-60. 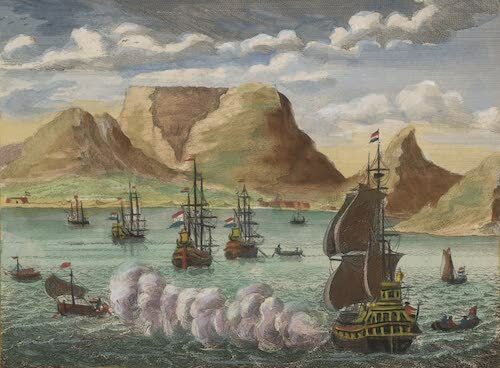 Arriving at the Mandab Straight at the mouth of the Red Sea, Tew joined other pirates who were lying in wait for the annual Mughal treasure convoy. Tew and several other famous pirate captains decided to partner up in order to capture this convoy as it sailed home from Mecca. Tew was in command of the Amity, with Henry Every aboard the Fancy acting as fleet commander. One day they finally spotted the ships and the final days of Tew's life began. 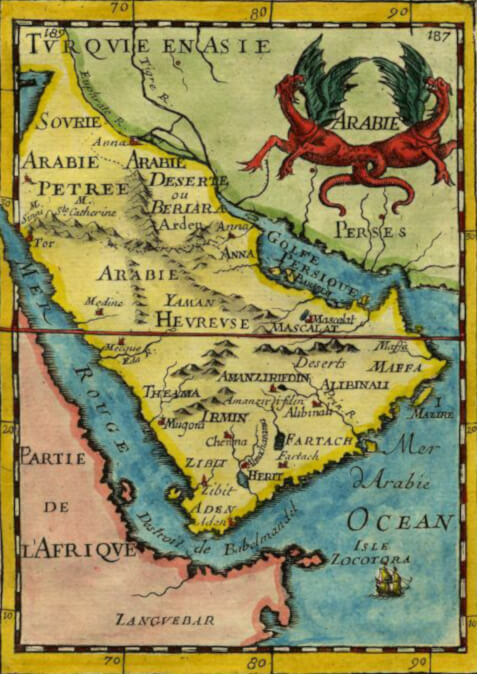 In September of 1695, Tew teamed up with the infamous pirate Henry Every in order to attack the treasure laden Mughal convoy that was making the annual Hajj pilgrimage to Mecca. They soon spotted the convoy however, the Mughals were able to lose the pirates in the night. Tew and Every pursued the convoy and in the course of the engagement, Tew attempted to overtake one of the Mughal ships. He was hit with a cannonball during a broadside attack that killed him instantly. With Tew dead, his crew surrendered and were captured by the Mughals. The crew was later freed when Every captured the ships, yet Tew's ship was never recovered. Thomas Tew lives on in infamy due to his supposed role in starting the contested settlement of Libertatia on the island of Madagascar. It was during this time that William Kidd was commissioned by King William III in order to track down Tew, Every and the rest of the Malabar pirates. However, unknown to the authorities by the time Kidd was commissioned to find Tew he was already dead. Thus Kidd's expedition was set up for failure from the start without any of them even realizing it.